Not your average garden plant, Ruby Saltbush (Enchylaena tomentosa) is a small shrubby plant grown for both the leaves and the small bright red fruits or berries. From a nearly forgotten bush food to a ‘must have’ food experience, Ruby Saltbush has now appeared on the menu at restaurants including the acclaimed Brae in the Otway ranges. The foliage discovered with small white hairs, these help protect it from the extreme heat of its native habitat. Low growing, and preferring a position in full sun it is grown for the edible leaves. The leaves are usually cooked or boiled to reduce the quantity of oxalic acid before eating. Once established this is a hardy plant, fast growing and bushy in habit. There are two varieties Enchylaena tomentosa var. tomentosa and E. tomentosa var. glabre which is a scrambling or climbing variety. Found naturally in salt affected areas, such as salt lakes in inland areas and inter tidal zones near the coast, it was first identified in near desert area in areas around Alice Springs the botanical name is Enchylaena tomentosa. This is a plant that require exceptional drainage and full sun to thrive. It will grow in soils that tend towards saline. It does have a little history, also known as Sturt’s Saltbush and Barrier Saltbush and the explorer is said to have eaten both the lives and the berries. It is the berries that are becoming popular, with a taste that is described as ’sweet and salty’. Propagation is from seed as well as from cuttings. The best growing conditions will be in a very well drained soil and a sunny position. It is a plant that will grow in containers and once established is very low care. Choose a free draining potting mix, once planted try to give seedling plants a little shade until they show good signs of growth. The culinary uses include harvesting both the leaves and the small berries. The berries are eaten fresh and also used to make a tea. Enchylaena tomentosa var. glabra – The red fruited form which is scrambling in habit. 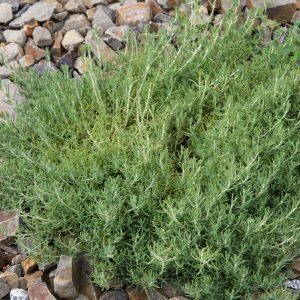 Common Names – Ruby Saltbush, Barrier Saltbush. Soil – Well drained is essential. Position – Full Sun to very light shade. Spread – To around 2 metres. Foliage – Mid green covered with fine white hairs. Flowers – Small and followed by small red berries.